A review of From Partisan Banking to Open Access: A Study on the Emergence of Free Banking in Early Nineteenth-Century Massachusetts, by Qian Lu. How does freedom and equality before the law supplant coercion and inequity? The standard answer is that a democratic revolution of the people overthrows the oppressive minority. Qian Lu’s dissertation challenges this conventional wisdom. It does so by examining the dynamics of social transition in the context of a particular time and practice: the time is post-constitutional Massachusetts, and the practice is banking. The resulting scholarship is both informative and thought-provoking, and ought to be read by both historians and economists alike. Historians of early American history and historians of finance will find a wealth of new data in this dissertation. It presents new source material and statistical analyses of bank balance sheets, the interconnected nature of banking and politics, and many other aspects of banking in early Massachusetts. This information is important historically mainly because it sheds additional light on the nature of the clash between the United States’ nascent political parties. The critical role that banking played in the political struggles of early American history can hardly be emphasized enough, and the dissertation provides quantitative data that shows a level of connection between politics and banking in early U.S. history that is almost shocking. The dissertation itself does not provide much historical context for the data that it reports or delve too deeply into the literature that examines these issues. Rather, it remains faithful to the method of cliometrics, and provides new data from which new inferences are drawn and which others can now use to test competing perspectives and hypotheses. As such, it nicely compliments the broader examinations of both early American finance and the ideological debates between the Federalists and the Democratic-Republicans by other authors, such as Edwin Perkins or Gordon Wood. From the perspective of economic theory and political science, the primary contribution of the dissertation is that it provides compelling historical evidence that supports the theoretical analysis of North, Wallis and Weingast, who argue that two alternative mechanisms exist for restraining violence in society. In limited access societies, order is maintained by political elites who have an incentive to limit violence so as to maximize their own “rents,” i.e., exploit their control of government intuitions and legally plunder through extortion, monopolies, restrictions, kickbacks, and so on. In open access societies, violence is suppressed by having open access to institutions and organizational forms and free competition. North, Wallis and Weingast argue that, under the right circumstances, competition over rents among political elites in a limited access order can lead them to start adopting formal legal rules that support more open access, and that this is the key to economic development. Qian Lu’s dissertation provides such a wealth of detailed historical information that is hard to dispute North, Wallis, and Weingast’s theory that inter-elite competition caused the transition from limited to open access in the particular case of banking in Massachusetts. The first chapter of the dissertation introduces this conceptual framework and surveys previous literature that attempts to explain why the number of corporations in America increased after the Revolutionary War. It finds that previously “American scholars have, to a large extent, accepted Tocqueville’s argument that a combination of culture and democracy formed historically unique preconditions for the emergence of a rich civil society (p.12).” This view, epitomized by Daron Acemoglu and James Robinson, holds that the transition to an open access society occurs when the regular citizens limit or overthrow the elites, and that in American history the decisive factor was the American Revolution and subsequent adoption of inclusive democratic institutions. The dissertation challenges this traditional view, and argues that the mere existence of markets and democratic elections is not enough to guarantee freedom because these institutions can be captured in a limited access society by a coalition of political elites who use them as a means of obtaining rents. Banking in Massachusetts is presented as a case study that illustrates this point. Although a democratic state, banks in Massachusetts were controlled by members of the Federalist Party until 1811, who were able to enjoy the benefits of banking services while limited others from having access to the same benefits. Banking was partisan, and became freer after competition from the Democratic-Republicans persuaded both sides to see the advantages of open acess. Chapter 2 describes how the struggle in early Massachusetts between the Federalists and the Democratic-Republicans to control banking through the chartering process counterintuitively led to a policy of free entry. From 1790 to 1810 banking in Massachusetts was political and partisan. Throughout this period the Federalists dominated state politics and exploited this position by chartering banks ran by members of their own party and refusing to charter any banks ran by Democratic-Republicans. The banking system became a source of special privilege for Federalists, who were able to direct the flow of financial resources to their own members and limit their rivals from having access to the same benefits. The situation changed abruptly in 1811, when the Democratic-Republicans, led by Elbridge Gerry (of gerrymandering fame), took control of both houses of the legislature and the governorship all in the same year. The timing was serendipitous for the Democratic-Republicans because the charters of all existing banks except one were set to expire in 1812. Since all of these banks were dominated by Federalist interests, the Democratic-Republican legislature refused to re-charter any of them. The Democratic-Republicans then chartered two new banks under their own control. These reforms completely upturned the flow of patronage coming from the financial sector. Although the Federalists were immediately able to regain control in 1812, they were snake-bitten by the events of the previous year. Thereafter the Federalists supported a policy of free entry so that they would still receive bank charters if they should lose control again, and agreed to pass formal legal rules to equalize banking privileges in the form of the 1829 Regulatory Act. The competition between Federalists and Democratic-Republicans thus set into motion the process that would eventually lead to open access to banking, which culminated in the 1851 general incorporation law. The historical narrative of chapter 2 is fascinating and convincing. A strong feature is that the narrative is supported by numerous charts and figures, which relay data that backs up the author’s interpretation that inter-elite competition led to open access in banking in Massachusetts. Chapter 3 provides empirical evidence that banking was indeed a partisan source of special privilege from 1790-1860 in Massachusetts, despite the location being in a newly-created democracy and regardless of the equalitarian rhetoric of the state’s founders. First, based upon archival research into the names of bank directors and politicians, the author finds that politics and banking were highly intertwined, although the connection between the two gradually became weaker after 1812. Astoundingly, prior to 1811 over 70% of bank directors either had been or would become state legislators at some point in time. This proportion remained high after the “bank war” between the Federalists and Democratic-Republicans in 1811, but slowly dropped to 40% by 1860, supporting the thesis that banking became freer and less partisan after 1812. Second, the author provides detailed evidence showing that prior to 1811 it was difficult for groups to obtain a bank charter unless they were connected to the Federalist Party, but that it became easier for them to do so in subsequent years. After 1811 it became 20% more common for the director of a new bank to be a known Democratic-Republican legislator as opposed to a known Federalist legislator. And third, the author finds that the average length of office of a bank director who was also a legislator fell from 10 years in the early 1800s to 2 years in the 1850s. This suggests that the political power of bank directors fell over time, supporting the hypothesis that banking became freer after 1811 and less connected to politics. This chapter is worth reading for anyone looking to better grasp the sheer magnitude of the intermingling between politics and banking in early America, and how these trends changed over time. Chapter 4 strengthens the conclusion of the previous chapter that the connection between banking and politics weakened over time by looking at legislators who were also bank directors in the same year. The author finds that in the 1790s it was quite common for legislators to simultaneously serve as a director of a bank, but that this became less common as time went on. Looking solely at politicians who were also bank directors at some point in their lives, and using regression analysis, he estimates that in the 1790s a legislator actively in office was 50% more likely to serve as a bank director than someone who was a legislator previously or wouldn’t be elected until later. In the 1820s this probability fluctuated around 20% more likely, and by 1840s this difference fell almost to zero. Chapter 5 explores whether banking remained bastions of privilege in the 1840s and 1850s or whether the diffusion of benefits from financial development became more widespread as entry into the business of banking became less restricted. The author addresses this question by examining whether the wealth inequality between bankers and the rest of the population declined after 1829 and whether as time went on newly chartered banks became smaller in size and had fewer legislators on their boards of directors. Using data collected from The Boston Tax Lists, the author finds robust evidence that the relative wealth inequality between bankers and the rest of the population remained stable from 1829 to 1860. Interestingly, this contrasts previous findings that in the 1830s in Rhode Island the wealth of bankers became more equal to that of the rest of the population (Lamoreaux and Glaisek, 1991). Next, using data from the bank balance sheets and the list of legislators and bank directors, the author finds that new banks chartered after 1843 had less assets and had fewer legislators on their board of directors. Taken as a whole, the evidence from chapter 5 suggests that banking became less elitist over the first half of the nineteenth century in the sense that it was not dominated as much by political access. However, banking was not more egalitarian in the sense that the disparity between the wealth of bankers and the rest of the population declined, and it is possible that democratic or grass roots banking did not exist in Massachusetts at that time. Chapter 6 examines how the Massachusetts banking experience informs the more general theoretical debate about how societies have successfully transitioned from a situation where politically privileged elites control access to economic resources to one where access to resources are potentially open to everyone. The author argues that open access to banking in Massachusetts did not result from a democratic overthrow of vested interests by the common people. The Federalists could potentially have stabilized a coalition to dominate access to banking, even in the presence of democratic elections. Instead, the conflict between competing groups of elites led to compromise between Federalists and Democratic-Republicans, and an agreement by those in power to create institutions that would protect access to financial services for those who were not currently in control of the machinery of state. Overall, Lu has written a good dissertation that illustrates how the rigorous application of economic methods to a specific topic can further our understanding of economic history. The findings have important implications for a wide variety of topics, including political theory, American political history, the history of finance, the sources of economic inequality, and economic development. Hopefully it will inspire future research in all of these areas, but especially explorations of the mechanisms that cause societies to adopt institutions that protect individual freedom. University of Maryland, College Park. 2014. 209 pp. Primary Advisor: John Wallis. 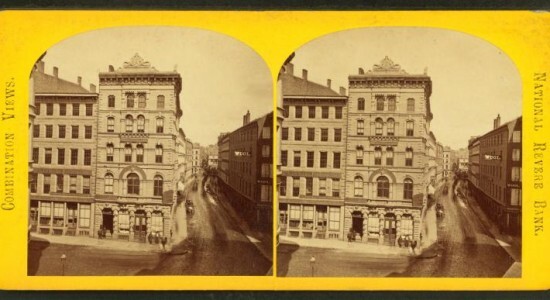 Image: National Revere Bank (1876). NYPL Digital Collections.